Tip: Follow Chef Marshall’s simple steps to free yourself from the sweet addiction and enjoy treats on your own terms. From birth, we are programmed to associate sweet foods with nutrition, comfort and nurturing. Although most of us know consuming too much sugar leads to health risks like obesity, type 2 diabetes and heart disease, we are surrounded with highly processed, sweetened foods, so it is no wonder we have a hard time setting limits or saying no. Understanding how your body responds to sugar can help you get over the guilt and take steps to successfully break your sugar habit without giving up on enjoying treats in moderation. Sugar – As Addictive as Cocaine? Have you ever wondered why you crave sweet foods? Consuming sugar activates the same brain circuitry involved in addictions to drugs like cocaine. Sugar induces reward and pleasure, alters mood, produces cravings and may elicit biochemical signs of withdrawal in the brain – all characteristics of an addictive substance. It turns out there is a biological reason we reach for that box of cookies when we are stressed. Recent research shows that consuming sugar helps turn off the body’s stress response, leading to less stress-induced cortisol. Regularly consuming sugar decreases your ability to taste sweetness, meaning you need to eat more to get the same sweet taste. The good news is by reducing your sugar consumption over time you can ‘retrain’ your taste buds to become more sensitive to sugar. Chef Marshall’s simple steps allow you to break your sugar habit so you can enjoy sweets in moderation without cravings or guilt. Train your taste buds – Reduce the amount of sugar in your food. After several weeks of eating less of it, you will become more sensitive to sweetness – and can eat less without noticing a difference in taste. Replace the sugar in your food with natural sweeteners – Fruits and certain spices, like cinnamon and vanilla, lend natural sweetness to foods, helping you cut back on sugar without giving up on taste. Chef Marshall’s Slow Cooker Cinnamon Sweet Potatoes turn naturally sweet, nutrient-packed yams into a delectable side dish to replace the traditional marshmallow-and-brown sugar version. Exercise regularly – Recent research suggests cardiovascular exercise increases self-control and helps you resist cravings, leading to smarter food choices. Outlast your cravings – Cravings only last about 15 minutes, so distract yourself with a quick walk or a glass of water to avoid giving in. Eat foods rich in fiber and healthy fats – like olive oil, nuts and avocados – to help keep your blood sugar steady and stop cravings in their tracks. Get enough sleep – You are more likely to crave sugar and cave to cravings when you are sleep deprived. Avoid artificial sweeteners – Artificial sweeteners cause intestinal distress and may alter the way your body metabolizes sugar, causing confusion between the gut and the brain. And since you are still eating sweet foods, you will continue to have sweet cravings. When you understand the biochemical effects of eating sugar, you can stop beating yourself up over a lack of willpower and start taking steps to enjoy treats on your own terms. 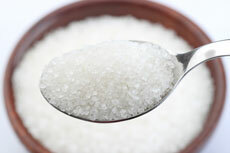 Train your taste buds and use natural sweeteners to reduce the sugar in your food without compromising flavor. Eat a diet rich in healthy fats and fiber, get regular exercise and adequate sleep to stop cravings in their tracks. Chef Marshall’s simple steps help you reduce your sugar intake without giving up on the pleasure of enjoying sweets in moderation.